Looking for a style that's relaxed yet sophisticated for your home? We've just introduced the perfect collection for you! Welcome the Easton Collection, a mixture of light and dark furniture options that include attention to detail and impeccable designs. The Easton Collection offers the Sea Breeze Collection, a coastal inspired collection in an antique white finish, and the Blue Ridge Collection, an updated traditional collection with a nod to rustic in a cherry finish. Which one goes into your home, is up to you! With a look that's straight out of a magazine, these collections offer a luxury look with a reasonable price tag. Remember - luxury furniture doesn't have to be stuffy! We love these collections because they're a little relaxed, whether you choose the coastal influenced furniture or the rustic influenced furniture. 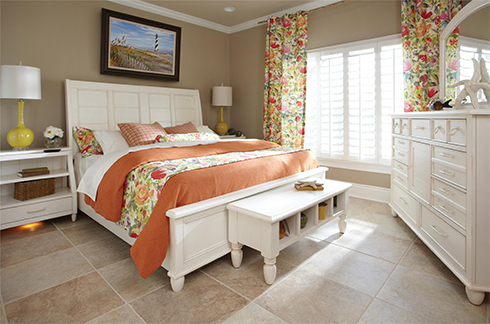 The Sea Breeze Collection may feature a white finish, but it's still warm and inviting! With a variety of dining room, living room, and occasional furniture pieces, you can truly fill your whole home with this collection if you wish. Within the Sea Breeze Collection, pieces feature hardware that includes simple linear bar pulls and single ring drawer pulls. Turned legs, wood paneling, angled lines, woven seats, and crown molding details take this collection beyond the norm. Complete with wire management holes and enough storage for your cable boxes and dvd players, the Sea Breeze collection offers a unique entertainment console and bookcases to create a media wall unit that's meant to be by the sea. From casual dining furniture to a traditional trestle leg table, the Sea Breeze collection offers a variety of options when it comes to dining room furniture. Three different table types, and two different chairs types are among your options. Plus - you can use the curio cabinet, sofa table, or bookcases as storage options in your dining or kitchen area. With a nod to traditional design and a hint of rustic elegance, the Blue Ridge Collection fits perfectly in your homes in the Washington DC suburbs! With a reminder of the beautiful nature there is outside, this collection features a traditional multi-step cherry finish with amazing details. The panel bed with curved headboard features a tall headboard that certainly becomes the focal point of the room! Luckily, this headboard comes in two pieces that can be assembled in your bedroom so it's easier to fit through hallways, stairways, and doorways. Turned feet and crown molding details provide an updated traditional look for your bedroom. This desk and hutch are a standout piece from the Blue Ridge Collection. A unique look that's tall provides ample functional storage in a small footprint. What a great way to get and stay organized! The Blue Ridge Collection also has dining room options to choose from! Shown in our Basics Showroom, the rectangular dining table has a traditional feel without overly ornate detailing. Choose which chair style you like best and add some storage for a perfect dining room. To view these collections in person, visit our Basics Showroom - building #3 in our Dulles, Virginia Furniture campus. With free design services and hundreds of room settings, you're sure to find inspiration and ideas here for your home! Need help? Just ask! Use our new Design Help form to submit your design dilemma and we'll help you get started on your next project.